As college students dive into any parents nightmare–binge drinking– many wonder, “will I gain weight,” “will beer give me a gut?” And I began wondering, is the Dad bod now in style? Of course I am kidding, but realistically how likely is this debacle? How easy is it to be this dreaded beer belly? Thousands of college students each year drink tens and tens of beers weekly, and it may not seem to be detrimental, but from experience watching my older friends come home for breaks, believe me the beer gut is possible and in full effect. This question is burning in my brain, because although I try my best to eat healthy (sometimes) and continuously workout….am I doomed to gain the extra pounds, and the shall not be named beer belly? Are beer guts merely due to chance? Are some individuals more prone to this outcome? In an article written by the European Journal of Clinical Nutrition, on the cross between beer and obesity, aka the infamous beer belly. In this study it used a cross-sectional study in order to explain the correlation between the amount of beer an individual drinks and obesity in the abdominal area. They used measures of Waist to Hip Ratio and BMI determine the interrelation. For the physical study, 1141 men and 1212 woman ranging from 25-64 participated in a survey and an examination of their varied alcohol intake per week. Measurements were taken of each individual, and weight was recorded. The results of the survey revealed that 73% of men were beer drinkers per week, and 62% of woman. While the other percentages were wine drinkers. Then the correlation with the amount of beer intake these individuals consumed and the body measures were compared drinkers and nondrinkers. Additional outside or confounding variables were measured as well, including the age o f the individuals, determining if they smoked, the total cholesterol, and the amount of activity they due on a daily basis; this is included in order to rule out or include third variables as a reason for increased obesity. For numerical findings, in the week examined the intake was 158g for men and 22g for woman. The average WHR was .93 for men and .81 for women participants, and the BMI was 27.1 for men and 26.6 for women. During the examined week, an average of 3.1 beers were drank weekly for men and .3 for women. However, the measures were not statistically significant since the measures were not directly correlated with increased weights. WHR was the only measure that was associated with this cross, only in men. Woman did not explicit any convincing increasing results, and if there were results they were small, most likely being a result of chance. Many results seem to be from confounding variables and also the difference in drinking frequencies in areas and lifestyles. Some confounding variables like eating habits, metabolism, exercise, etc. Although there were not any direct correlations between weekly beer intake and increase in obesity, a third variable that was valuable in the findings was that increased smoking seemed to change the amount of beer consumed, which could be another possibly reasoning to why this study was mostly inconclusive. Regardless, I have seen too many college kids come home with a few extra pounds, and whether is it strictly the beer or confounding variables cursing their abdominal, I don’t want to take any chances. I’ll be at the gym! This entry was posted in Uncategorized on October 20, 2016 by Olivia Helen DeArment. 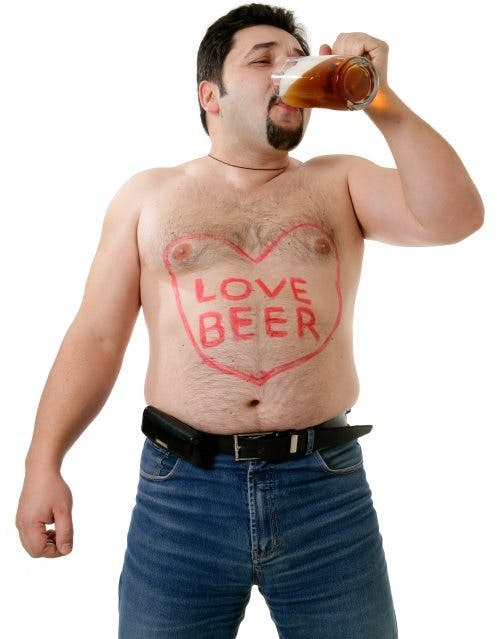 As I get older, I see more and more people coming home from school with an exponentially growing beer belly. I thank God every day for my fast metabolism that allows me to stay slim, but maybe I shouldn’t be so thankful. According to this article http://www.express.co.uk/news/weird/118335/What-women-want-Beer-bellies-and-hairy-chests , woman are moving more towards the “manly men” with a beer belly and they are fleeing from the “tall and fit” metrosexuals. So maybe it’s time to lay off the treadmill and start drinking some beer! This blog post raises an interesting question in what causes beer bellies. I became curious about what negative effects a beer belly can have on a person. According to an article in GQ they could actually lead to death! The article cites human anatomy as the cause of this. Since most of your internal organs are in the stomach, having a large amount of weight in that area can have detrimental effects on otherwise healthy people. The article even claims that having a beer belly is more dangerous than being simply obese. Very scary for a college student.